This component is part of the Fuel System. For a comprehensive look at how this all works together, see Engine Starting Aid Tour. The Altitude Compensator or BAROMETRIC CELL (BC) – compensates for changes in air pressure (or outside temperature) by varying the amount of fuel injected based on the atmospheric pressure. The barometer used on all timed indirect injection (MFI) is of the aneroid type and is made up of thin elastic metal disks contained in a chamber which sits on the top of the injection pump. The chamber is partially evacuated of gas and prevented from collapsing by a strong spring. The design of the chamber means that the barometer is not serviceable by a home mechanic. 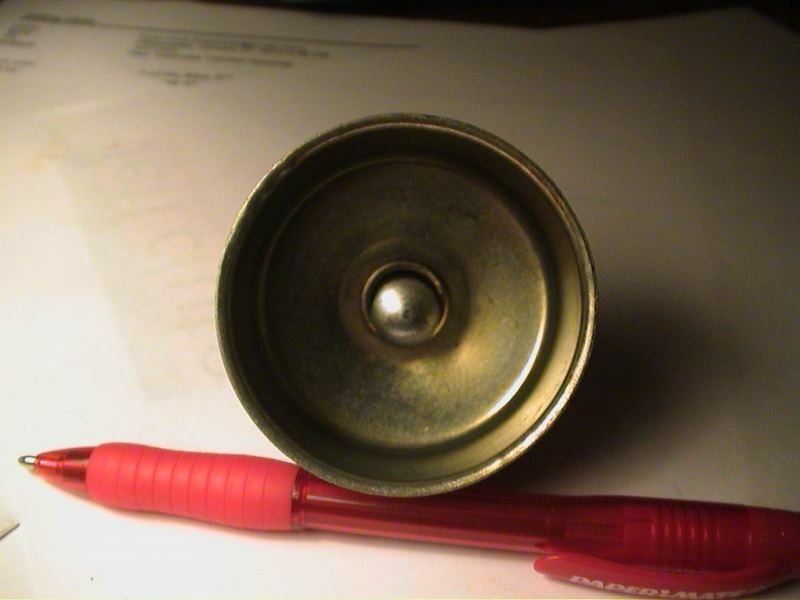 When the elastic metal disks are subjected to small changes in atmospheric pressure they are designed to shrink or expand. 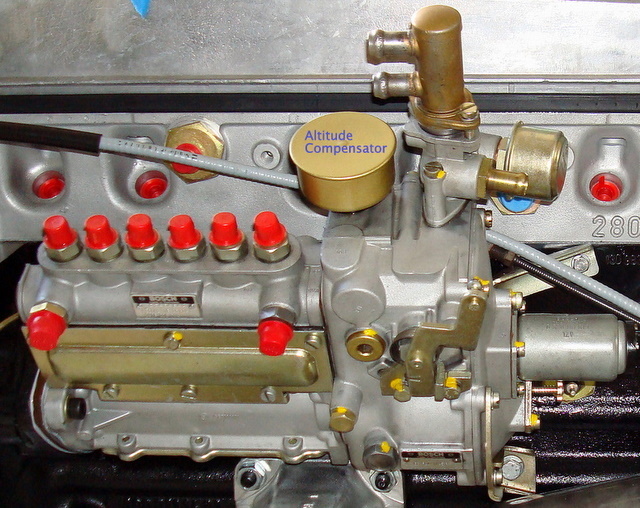 This expansion and contraction drives a mechanical lever inside the injection pump which alters the position of the control rack and allows the quantity of injected fuel to be increased when the car is operated at high air pressure (for example, sea-level driving) and decreased when operated at low air pressure (for example, mountain driving). The Altitude Compensator is a round canister that sits on top of the fuel injection pump and is located next to the Warm Running Device (WRD). So, why does the pin move down/out when the ambient pressure decreases? It must contain sealed bellows, like in a barometer... Maybe sealed in Stuttgart? WOW, that would mean it contains 40+ year old air? 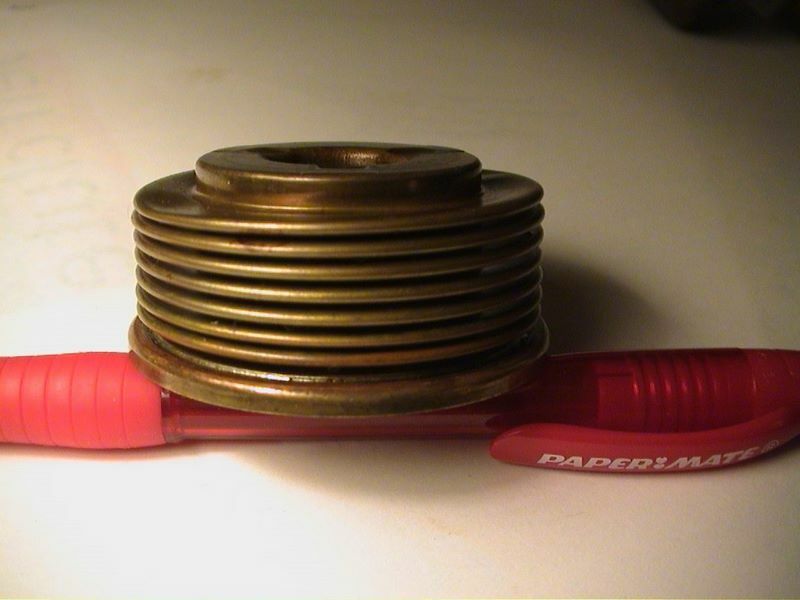 When the car is up high, like on top of Mount Rainier, the ambient pressure is lower and the bellows expand? When the bellows gets a hole, from age, it doesn't expand any more? It’s then defective. 100 mm HG changing (vacuum) = 0,58 mm stroke of plunger. First you have to mount the altitude compensator on the Bosch testing Equipment number EFEP 418 with gauge EFAW 7 and o-ring seals. Adjust 20 mm HG vacuum . Adjust the scale of the gauge to 0 . Increase the vacuum to 200 mm HG . 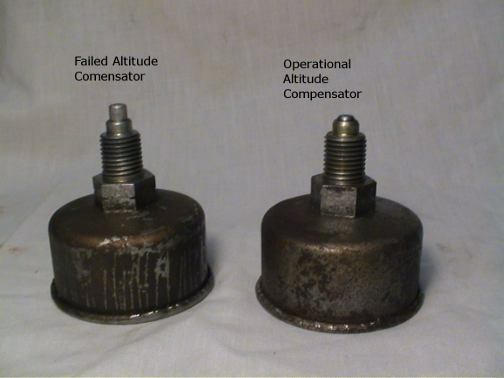 Dilation of the altitude compensator plunger now should be 1,00 - 1,25 mm. If not, it does not work correctly. Real pressure at your garage is 600 mm HG. Difference therefore 137 mm HG. The formula says: 0,58 x 137 / 100 = 0,79 mm stroke of plunger. Mount the Bosch testing equipment Nr. EFEP 417 with the gauge EFAW 7 on the injection pump altitude compensator area. Adjust 0 on the scale of the gauge, when you have about 3 mm pre-tension. Alter the knurled screw on the injection pump for 0,79 mm. (you have calculated) Now you have to notice how many mm is the movement of the control rack and notice the fuel delivery rate at full throttle (for this procedure the injection pump has to be mounted in a Bosch injection pump test stand). Mount the altitude compensator instead of the testing equipment Nr. EFEP 417 on the injection pump. Add shims to get the same mm movement of the control rack and the same fuel delivery rate. Without the Bosch fuel injection pump test stand, you can not really adjust an altitude compensator. At best you test the movement of the plunger when changing the vacuum. MB used a barometric compensator from the aircraft industry for our cars with an operating range from sea level to over 40,000ft. The test at 200mmHg described above is equivalent to testing at an altitude of about 9,000 feet. At this altitude we understand the pin will extend no more than 1.25mm. 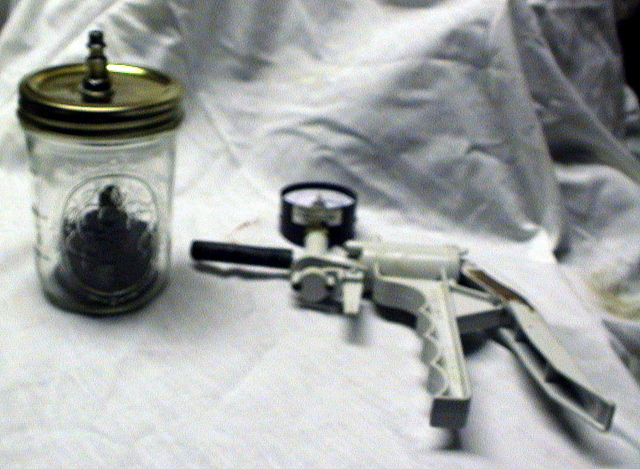 Put the altitude compensator in the jar, lid screwed on. The lid will need a small hole in it and you will need to determine how to connect the vacuum or pump to the lid in order to create a good vacuum. Maybe solder a small tube to the lid? Below is a picture showing side-by-side comparison of a good BC and a failed BC. There are two styles of BCs. 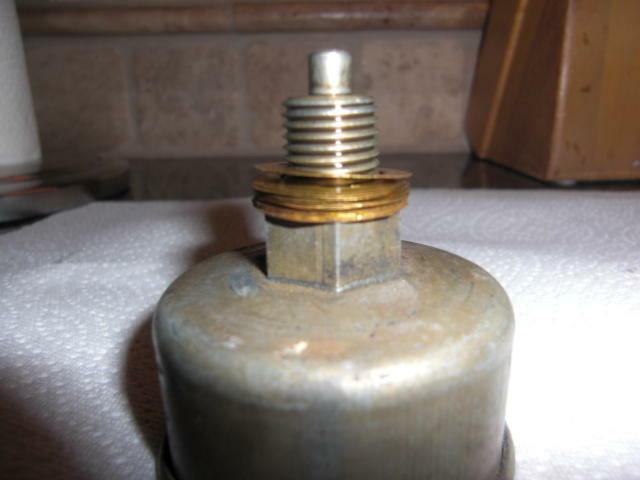 The first style pictured above has a brass collar at the top of the threaded section. The second style as shown below does not have the collar section. It is there fore important to measure the length of the BC pin from the base of the hex nut to the top of the pin. A good BC should measure approx 21mm from hex nut to the top of the pin. A bad BC will measure approx 25mm. Below is picture which shows side-by-side views of a good BC under test. At right you have a BC at rest. 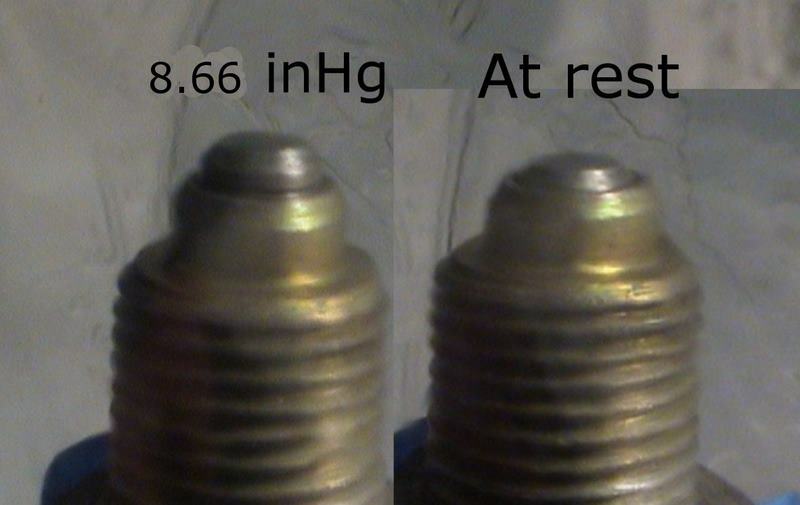 On the left is a BC under 8.66 inHg vacuum. The MB spec posted by Franz says the pin should extend between 1 to 1.25 mm in the test chamber when pressure is increased 200mmHg from a starting point of 20mmHg. The BC pin extends .003 inch for every +500 foot elevation change. 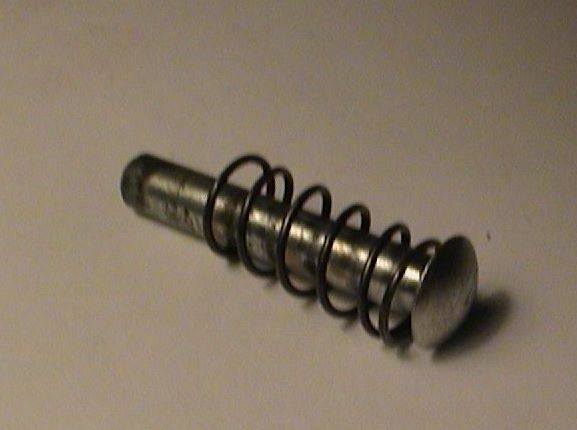 A failed BC will exhibit a fully deployed pin which will greatly lean the air fuel mixture. 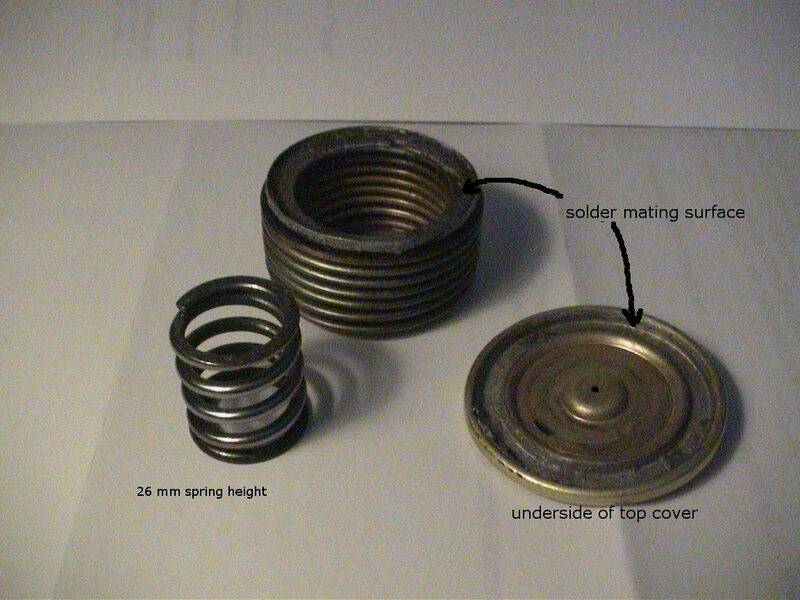 The failure mode for this device is a loss of vacuum seal inside the bellows. As the bellows loses vacuum there is nothing left to oppose the force of the spring inside the bellows. Today I put a .005 inch shim under the altitude compensator. Our air temperature is about 47 degrees F. and I noticed a few days ago the engine was running a little lean. This additional shim fixed the problem nicely. In colder weather the air is more dense and our cars don't measure air density. Last summer, when we had hot weather, the engine ran fine without the extra shim. How did I know the engine was running too lean? After it warms up, like driving it for a couple of miles, the cold enrichment device shuts off, but the engine is still not quite at hot operating temperature. At that time it is a little sluggish to respond to more throttle and will backfire when throttle is opened more. When engine warms up more, the symptoms disappear. With the 5 thousands inch shim installed, it runs fine.